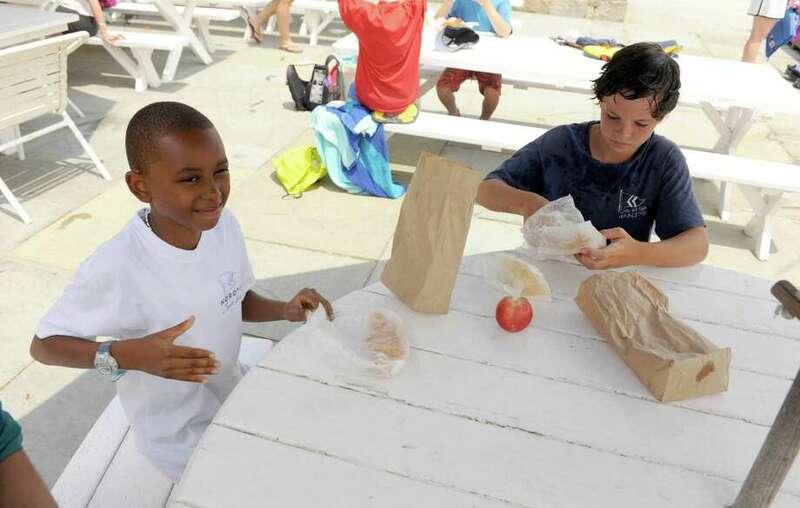 Kobe Tucker, 10, enjoys lunch with Chase Daley, age 12, at Noroton Yacht Club Wednesday, July 11, 2012. Kobe is visiting the Daleys as part of the Fresh Air Fund. Photo by Harrison Thompson, Darien, Conn.
Chris and Abigail Daley have five sons. Buck, Tad, Chase, Brooks and Jack range from 2 to 15 years old, so when 10-year-old Kobe Tucker was added to the bunch he fit right in. Kobe came to Darien from his home in Bronx, N.Y., for his second summer with the Daley family as part of the Fresh Air Fund, an East Coast charitable organization that connects inner-city children with volunteer host families in the suburbs. While two weeks is the standard amount of time a child stays with a host family, this summer Kobe is staying with the Daley's for eight weeks. "There's never been a problem," Abigail said. "I think people have a lot of apprehension about doing this and it is a joy for everyone. It's really one more kid in the mix." The program, for children ages 6 to 18, has chapters in 13 states, as well as parts of Canada. Abigail heard of it from Yvette Eenkema van Dijk, chairman of the program's Darien and Norwalk chapter. "I've always admired her," Abigail said. "She's always had Fresh Air kids, and so I said to her last summer, `I'm dying to do this.' And she said, `Well, this is Kobe and he wants to be with boys.'" Kobe got exactly what he wanted. Although he admitted he was a little nervous when he first arrived last summer, the Daley boys made Kobe feel right at home. "When we first met Kobe, we were having dinner [at Noroton Yacht Club] I think, and we were making sand castles," 10-year-old Tad said. "Then I showed him how to play butts-up and running bases." "Sometimes we play basketball, catch fireflies," Kobe added quietly as he ate lunch with several of the boys at the yacht club on Wednesday afternoon. Kobe and the Daleys are regulars at this spot. "We usually hang out here a lot or jump on the trampoline at home," Tad said. One of Kobe's favorite things to do when he comes to Connecticut is go swimming, he said. But there's plenty of time to do this after his daily sailing lessons. "Four of my boys sail in the afternoon and he sails in the morning," Abigail said. "So usually we'll come here and have lunch and play for a little while, and then Buck needs to go to sleep. And then I'll ask [Kobe] if he wants to stay here or take a rest, and he usually just wants to go home." Abigail said she was surprised by the amount Kobe sleeps. "I don't think he ever really has rested, so when he gets here he sleeps," she said. "It's wild. I think he's just sort of catching up." While Kobe shares a room with Tad and Chase, who is 12 years old, Abigail said he comes from having one of the only beds in his family's small New York apartment. Eleven people live there. "His parents both live there," she said, adding they are both loving and caring parents to Kobe. "I was terrified to go to the Bronx the first time because I thought it was going to be heartbreaking," she said. Instead, Abigail found a wildly hectic home where Kobe seems safe. "In fact, I think he's street wise, but he's not," she said. "He's very innocent." On a family trip to Vermont, for example, "he literally had never seen a mountain before," Abigail said. "And he learned to ski." She added, "One day we were going to another mountain and we said we're going tubing and he said, `Abby, are we going tubing in the snow or in the water?' He had no concept because we had been taking him tubing here on the boat. Everything is new, everything is exciting, everything is delicious." Between sailing, swimming, skiing, tubing, traveling and many other activities Kobe does with the Daleys, it is unlikely he will ever get bored in their company. Abigail said they even have plans to do more, like taking a trip to the Maritime Aquarium. "You know, six boys," she said. "You've got to keep them busy." Christopher Meyer contributed to this report.